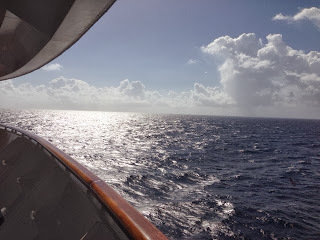 While onboard most mornings I'll wake and head up to a top deck where you can walk the entire perimeter of the ship. I love it. Outside, the sun shining, the salty air coating my lips. I'll put on my worship music and walk, sometimes for more than an hour. 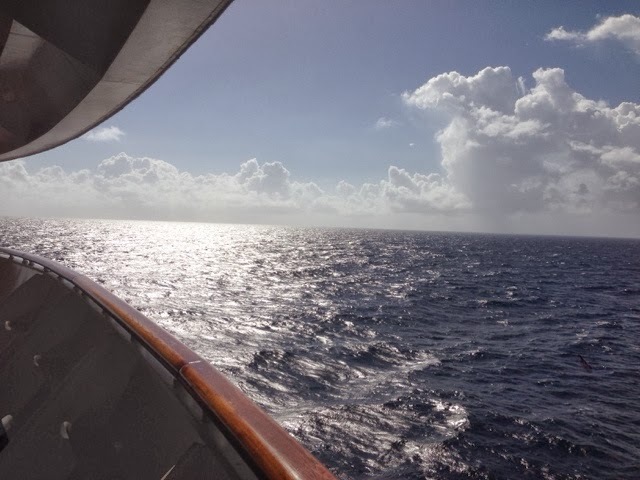 There's something about being in the middle of the ocean, nothing around, that starts to give you a unique view of God's creation. That's a lot of water he put down here! I can remember one morning that was a bit windy. Ok. A lot windy. As I came to the front of the ship, the wind increased so much that I could literally lean into it and be supported. Honestly, it was difficult to even take a step forward. Powerful. The waves crashed beside the boat and the sunshine beat down. I stood there and suddenly the story of Jesus calming the storm ran through my mind. He stood on the front of a boat and told the waves and wind "Quiet. Be still!" and they listened! I could stand in that wind all day, the force of it nearly stopping me from taking a step, and tell it to be still all I wanted. That wouldn't stop it from blowing though. And as it threatened to topple me, I was amazed again at the power of God. One word. Just one word and all of nature obeys him! The force of that wind was unlike anything I've ever encountered...except God. And that thought settled into my core, nearly bursting my soul. An awesome, physical reminder that we serve a God who commands not only nature with one word, but any force that may come against us. Things may threaten to topple us, but God has control. He'll either walk us through it, or he'll speak into it. Because no matter how strong that wind feels, God's stronger. He's bigger. And he's in control. What a beautiful post, Susan.